One to one support within and out with your own home to help build confidence and positive links within your community. Activities focussed on learning and accessing training, education and employment. Support is person centred and designed to enable you to be actively involved and in control of your own health and wellbeing. Our services are preventative in nature and increase the factors known to protect good mental health. Support activities are designed to increase self-esteem and autonomy and encourage the building of positive social networks with others. We provide signposting and actively promote access to mainstream local community resources and services. Our groups run approximately to a 6-12 week programme depending on the nature of the work and are designed to offer participants positive experiences our activities aim to encourage good mental health through a variety of wellbeing, physical and learning activities. Taking part helps you to build links into mainstream and accessible resources available in the community e.g. educational and training hubs, leisure and sports clubs, arts and music resources. We offer short courses within our programmes often in partnership with local agencies which supports confidence building and skills development and encourages continued participation and learning after moving on from GAMH. All activities are developed collaboratively with people who use the service and we always strive to ensure that our groups are acceptable and accessible to people from BME communities and other marginalised groups. 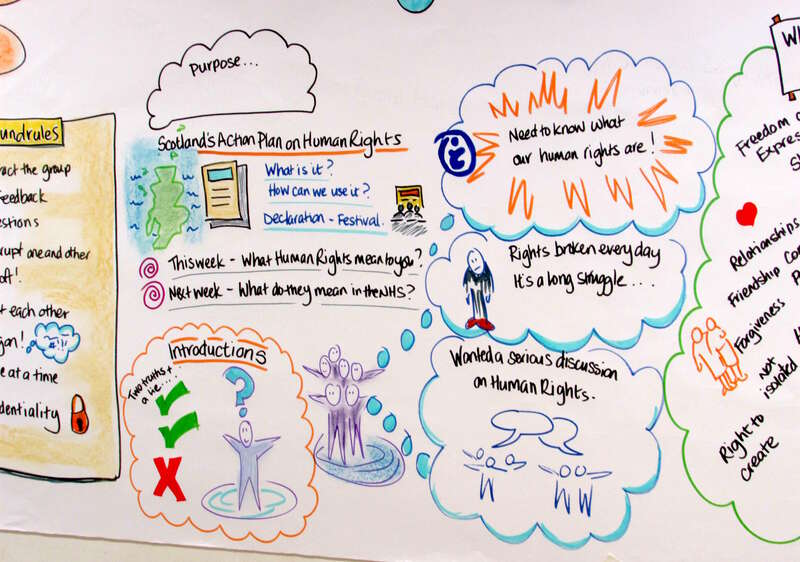 Examples of recent work Students from Glasgow University Enactus team created a series of workshops – WeCreate – which explore art, creativity and social enterprise We participated in Human Rights Awareness sessions with NHS Equalities in Health team, in response to the Scottish National Human Rights Action Plan which calls for a more visible approach to human rights in health and social care services. Our Positive Moves programme makes good use of the free facilities which are available throughout the city, including walking, cycling, bowling and tennis. Our growing project, ‘Roots to Recovery’, provides access to allotments and gardens where you can meet people enjoy the outdoors and work together with others to learn about gardening. We match you with a trained volunteer befriender. The volunteer befriender will support you to engage in a variety of social activities of your choice .Volunteer usually meet with you weekly, for roughly 2-3 hours a time, for up to a maximum period of 6 months. These meetings will not take place in your home as the purpose of the support is to build your confidence to get out and about in the community, build new interests and generally have a more active life. 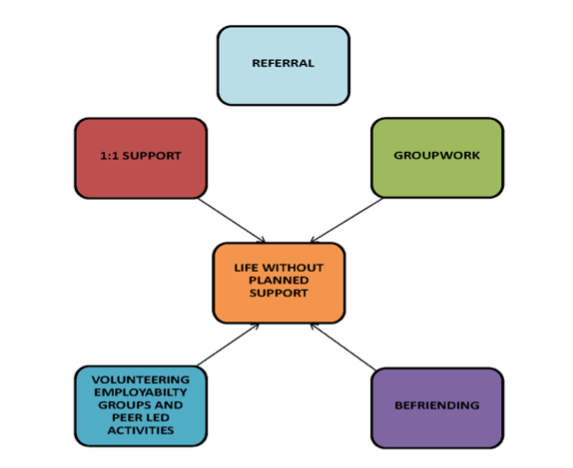 Befrienders will unfortunately not be able to help you with any personal care or household tasks because their role is to provide a particular type of social support. 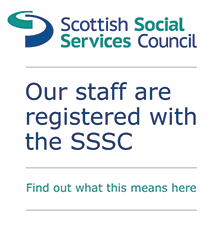 If you need other forms of support, you can inform the Volunteer Co-ordinator who will try to put you in touch with other services that might be able to help. There is no cost to uptake the service however you as the befriendee would have to pay for your own travel, light refreshments or entrance to social activities (e.g. cinema ticket). The volunteer will pay for themselves and be reimbursed for their expenses by GAMH. Within our group programme we have developed peer-led opportunities for participants who are about to move away from the service, to share their skills, knowledge and experiences in positive and creative ways. Successful applicants receive informative and interactive training, through the Motivational Exchange Programme, to fully explore the peer role and what it entails. Some peers have gone on to become co-facilitators who have delivered a series of workshops across the groups on an activity that they are passionate about. These taster workshops have covered local history, drama, gardening, arts and crafts and much, much more. An alternative to delivering workshops is for peers to take on the role of welcoming and orientating new members to the group and introducing them to their fellow participants and the activities available. Reduction in social isolation through being more connected to family, friends and communities. GAMH support is time limited to 6 months. It is available to adults aged 16 and over who have mild to severe mental health difficulties who are not linked to community mental health teams (CMHT) or eligible for self-directed support budgets.